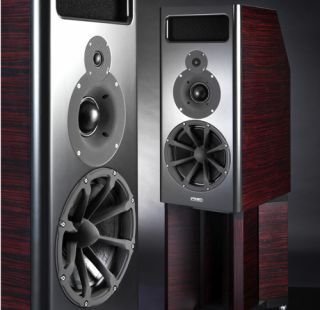 BRISTOL SHOW 2013: PMC shows off £25k BB5 SE speakers | What Hi-Fi? PMC has launched three new special edition speakers at this year's Bristol Show, the iB2 SE, MB2 SE and BB5 SE. The £25k BB5 SE speakers are taking pride of place in PMC's main demo room, running with Bryston electronics. Based on PMC's BB5-Active studio monitors, the new three-way BB5 SE speakers feature a newly designed cabinet and an extra special finish with extra detailing on the terminal panels and drivers. This flagship SE speakers are joined by the IB2 SEs, yours for a cool £13,475, and the MB2 SEs, priced at £16,100. The original BB5 was developed for the BBC Maida Vale studio complex and subsequently in facilities such as Metropolis in London, Teldex in Berlin, and by artists including Prince and Stevie Wonder. You can read more details on the PMC SE speakers on the PMC website.